Our first Rio preview looks at Pool A, which includes the tournament's favourite team as well as its greatest outsider. The current World Series Champions seem to have timed their build up to these Games almost perfectly. In just over a year from May 2015 to the end of the last World Series Australia finished in a podium position in seven consecutive rounds, reached the final in six, and won four. Coach Tim Walsh (who, uniquely, also saw the Australian men through their qualification process, which must be some sort of record) has built his team from the ground up, looking for the sort of players he wanted to meet his vision. Remarkably 11 of the 12 players in his Rio team do not come directly from a rugby union background. Six are from touch – very much a separate sport down under – two are from rugby league, while others were originally from sports as diverse as basketball, hockey and athletics. Only Shannon Parry was primarily a rugby player (Nicole Beck was also playing union when Walsh signed her up, but originally she too was a touch player; and Sharni Williams originally came from hockey). It’s something that Walsh and his squad see as a real advantage and has certainly allowed Australia to develop a style of play perfect for sevens without having to “unlearn” fifteens – a significant problem faced by almost all of their key rivals. Apart from the months before a World Cup, Australia do not have a fifteens programme, allowing them to concentrate entirely on sevens. With the encouragement of their national team's success even the majority of club players now only play sevens. One effect of this is that Walsh can already plan for Tokyo in 2020, and beyond. Many of his contracted players are still in their teens and at youth level Australia hold both Olympic and Commonwealth titles.For Australia, Rio is just the beginning. For all that, nothing is certain in sevens. Australia went into the 2013 World Cup as champions and were expected to at least reach the final – but they lost in the quarter-finals to Spain. More recently, having swept to three titles last season they lost in the semi-finals in Langford (with admittedly a slightly experimental team) and then in the final at Clermont. That said, if Australia failed to emerge from this pool then it would be arguably the greatest sensation in Olympic history. Indeed, anything other than a pool win would be remarkable. That would give the Australians a game against a best third place team, and then a semi-final against a pool runner-up. In short it is hard to imagine the “Pearls” failing to come home with medals around their necks. The only question is what colour they will be. Compared to the Australians, the US team could hardly have had a more disruptive lead-up to the Games. Richie Walker will be their third coach in a year, a situation that is less than ideal although Walker had been involved with the team under Rick Suggitt before Jules McCoy took over. The disruption cannot have helped the team’s performance in the World Series, but after a disastrous 11th place in Dubai, the Americans reached the quarter-finals in all of the remaining rounds. However, for a team with medal ambitions it must be some concern that the team has not finished on the podium since Atlanta in 2015. Indeed the United States have never finished in a medal position in any World Series tournament played outside the USA (though there were also third in the 2013 World Cup). The crucial game for the USA comes in the first round when they meet Fiji in what must be expected to be a near quarter-final decider, assuming all other games go to form (and they should). Fiji are a famously dangerous side, but the USA’s recent record against them is (apart from the Dubai debacle) excellent. In addition, although they lost twice to Australia last year, they did beat the Pearls the previous year. The United States should make the quarter-finals – probably as pool runners-up. How much further they go will depend on a quarter-final, probably against Great Britain or Canada. Huge potential, capable of beating anyone on their day, but staggeringly unpredictable. Nonetheless Fiji have been seen by many as a potential outside medal hope. This despite their only being in World Series – full time – for just two seasons, and the socially conservative nature of the islands which, until very recently, was a barrier to women’s rugby achieving its full potential. Olympic qualification has made a huge difference to the team. “There was no money to support the programme if we hadn’t qualified”, Cracknell revealed. The improved support had an effect last year, with four quarter-finals in five tournaments – the same record as the USA. 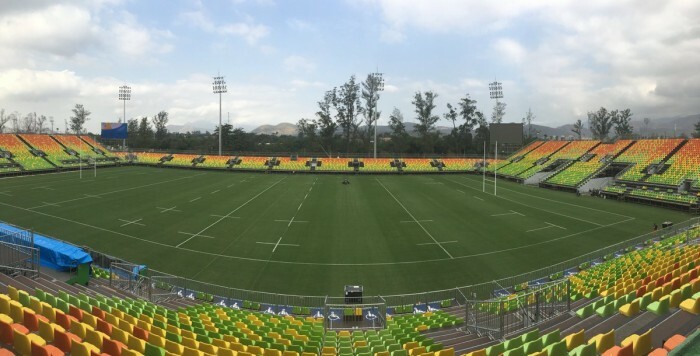 In many respects the Olympics have come perhaps too early for this team, but a good start against the USA and the anticipated win over Colombia on the first day should set up the Fijiana for the quarters-finals in day two. Colombia acknowledge that they are the outsiders in the tournament. "Australia ... They are the world champions, so we respect them a lot," says coach Laurent Palau. "and the United States and Fiji are superior teams to us." Nonetheless Palau is confident that his team could finish ninth, and potentially win a place in the World Series. “We know very well that we likely to be in the Bowl. But let's go with ambition, audacity, and above all to have fun." It is a highly ambitious hope for his team, and the late decision to select former US Eagle Nathalie Marchino – comfortably the most experienced player available to them –will at least help help the Toucans meet his target. Colombia have never beaten any of the other teams in this tournament, and to be brutally honest it is very hard to see that changing. Their only World Series appearance, in Sao Paulo last year, saw them play two of the three teams that they have drawn in this pool. They lost 41-7 to Fiji and 34-0 to Australia, and similar results can be expected here. When it comes to likely bowl opponents they have lost every game they have ever played against Brazil, and went down 19-7 to Japan in Sao Paulo. They have never played Kenya, and maybe there lies their best hope of a win - though it is a slight one. Colombia start the tournament as 12th seeds and it is very hard to see them finishing the tournament in a higher position.